Living in a kennel can be scary for dogs - the noises and smells of life in a cage can be overwhelming, and going months without love and snuggles from a real family is hard. Katy, a sweet Staffie mix, has been living in a kennel at a vet's office for more than 2,326 days. "Six years ago, my family left me tied to a tree in front of a vet's office. They never returned. I have lived in a kennel for 2,326 days. I need a forever home! Will you adopt me?" Katy's post has already gotten over 10,000 shares on Facebook - but there's been no update so far about an adoption. 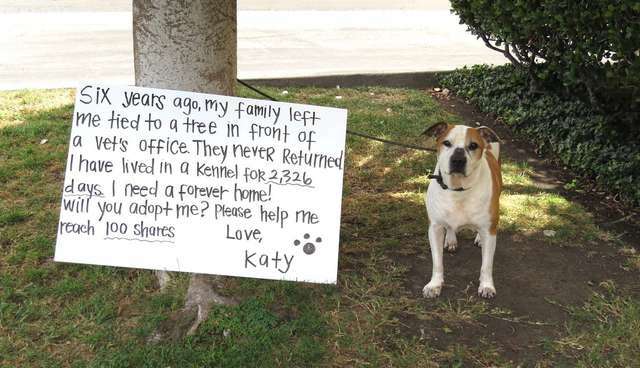 Social media can be a literal lifesaver for dogs like Katy. Back in April a New York shelter uploaded a photo of a dog named Chester, who had been waiting five years for a family. Within 24 hours Chester had found a happy new forever family. Check out Katy's Petfinder profile here. She's looking for a loving home where she can be an only dog. Hopefully Katy's story will have a happy ending just like Chester's. We're rooting for you, girl! If you're ready to adopt a waiting rescue like Katy in your area, check out Adopt-a-Pet.com.